Cardiff Devils players celebrate a Joey Martin goal. Pic: David Williams. Cardiff Devils set up a cracking home clash with Sheffield Steelers on Sunday after a stunning fightback in South Yorkshire. Captain Jake Morissette and his Devils were reeling at 5-1 down five minutes into the final period of their Elite League play-off quarter-final, but they hit back with a vengeance. Sean Bentivoglio (2) and Joey Martin scored three goals in 13 minutes and left the clash on a knife edge going into the second leg at Cardiff Bay’s Viola Arena on Sunday (6pm). 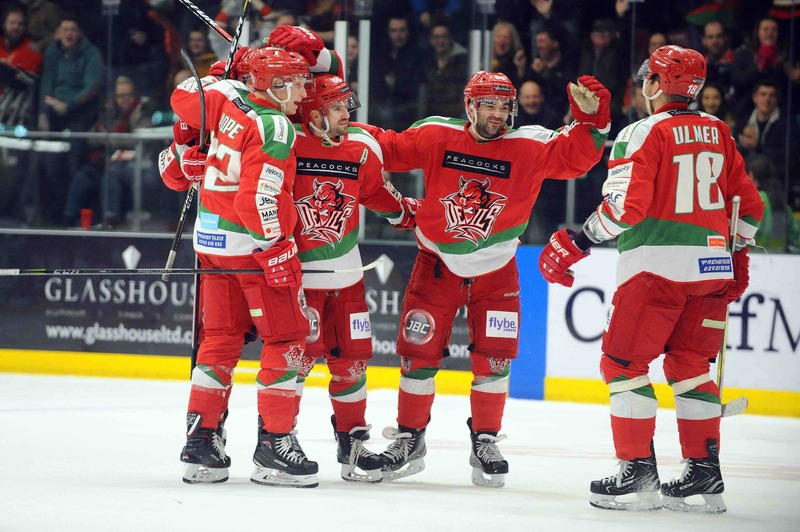 That will be the final match of the 2018-19 season for one off these teams – and it looks certain Devils will again be roared on by a sell-out attendance of 3,000-plus. Devils called up James Livingston, the import forward who missed the final Elite League match at Coventry Blaze, with Joey Haddad sitting out. Livingston, though, was thrown out on a 5+game misconduct for spearing in the second period. That won’t rule him out of the second leg unless the Elite League disciplinary department take further action and Devils will be delighted to be going into the home leg only one goal down. They showed tremendous character and spirit in a fightback which Steelers simply could not fend off. Devils’ Charles Linglet battles against Sheffield Steelers on Saturday. Pic: Dean Woolley. Scorers, Steelers: Robert Dowd 2+0, John Armstrong 2+1, Jordan Owens 1+0,Josh Pitt 0+1, Eric Neiley 0+2, David Phillips 0+2, Evan McGrath 0+1, Aaron Johnson 0+1, Tom Zanoski 0+1, Jonas Westerling 0+1. Devils: Layne Ulmer 1+0, Sean Bentivoglio 2+0, Joey Martin 1+0, James Livingston 0+1, Sam Duggan 0+1, Mike Hedden 0+1, Bryce Reddick 0+1, Charles Linglet 0+1, Evan Mosey 0+1, Matt Pope 0+1, Matthew Myers 0+1. Period scores (Steelers first) 1-0, 3-1 (4-1), 1-3 (5-4). Shots on goal: Steelers (on Bowns) 20, Devils (on Whistle) 27. Penalties in minutes: Steelers 2+4+4=10; Devils 0+29+0=29. Special teams: Steelers PK 2/3, PP 2/4; Devils PK 2/4, PP 1/3. Devils man of the match: Charles Linglet. Referees: Andrew Dalton and Stefan Hogarth. Belfast Giants take a five-goal lead Coventry on Sunday afternoon after an impressive performance at the SSE Arena. Clan go into their home leg leading by one goal after Flames fought back from three down after 40 minutes at the Spectrum. in the fourth quarter-final, Fife Flyers tied 3-3 against Nottingham Panthers. All second legs are on Sunday evening. Fife Flyers v Nottingham Panthers.